A regional daily’s political reporter who described an election visit by a Conservative minister as “a total farce” has now got a selfie with Prime Minister David Cameron. As reported by HTFP last week, Paul Geater of the East Anglian Daily Times wrote a column critical of visits by Health Secretary Jeremy Hunt and Transport Secretary Patrick McLaughlin to Ipswich after local journalists were given limited access to them. Paul described the visit by Mr Hunt as “a total farce” and claimed that Ipswich Conservative candidate Ben Gummer said campaigners expected local newspaper reporters to be “19-year-olds who don’t understand the subject”. It is part of a wider criticism of Mr Cameron and the Conservatives, who have come under fire for how they have treated the regional press during the election campaign. But Archant papers in Suffolk and Essex had a more positive experience when the Prime Minister visted the region last Friday. Paul met Mr Cameron in Frinton where the PM posed for a selfie with the political writer, pictured above. Said Paul: “He couldn’t have been more helpful and his team were determined we could get as much access as we needed. Mr Cameron also visited Archant’s office in Lowestoft, which is home to the Lowestoft Journal and the Eastern Daily Press. He was met by Journal editor Andrew Papworth and given a tour of the premises, along with Waveney Conservative candidate Peter Aldous. The Prime Minister took a keen interest in The Journal’s front page story about a bid to revive Lowestoft’s historic Claremont Pier, which is being supported with a £10,000 grant from the government’s coastal revival fund. He also read the paper’s four-page election special, including stories about foreign secretary Philip Hammond’s visit to Lowestoft and an article about a UKIP candidate’s business failure. 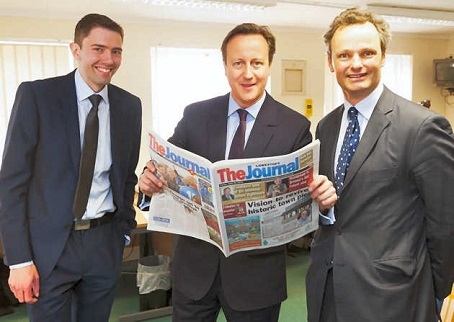 David Cameron is pictured on a visit to The Lowestoft Journal with community editor Andrew Papworth, left and Conservative candidate Peter Aldous, right. I like the way the community editor dressed the same as Cameron to make him feel comfortable during his visit. Did he bring multiple ties and wait to see what colour the PM was wearing before putting one on himself, or did he phone Cameron’s PR team and ask what tie he would be wearing on the day? Bloke on right surely not an actual human? Bloke in middle, obvs a lizard. Wow, Mr Geator. That’s one for the family album. You must be so proud!